↑ "Sonu Nigam Biography". http://www.4to40.com/legends/print.asp?p=Sonu_Nigam। আহৰণ কৰা হৈছে: 20 January 2012. ↑ "It's Nigam, not Niigaam, Says Sonu". The Times of India. 8 September 2010. http://articles.timesofindia.indiatimes.com/2010-09-08/news-and-interviews/28225350_1_sonu-nigam-change-phase। আহৰণ কৰা হৈছে: 3 April 2012. ↑ 3.0 3.1 3.2 3.3 "Sonu Nigam". 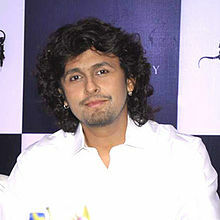 http://www.sonuniigaam.in/aboutme.php। আহৰণ কৰা হৈছে: 25 July 2008.